This is actually the back of a recipe clipped from a Gold Medal Flour insert. But it’s educational, so I saved it for you. You’re welcome. 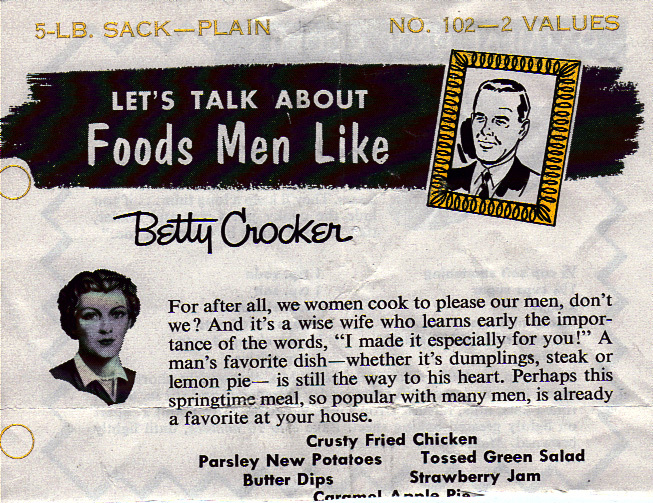 For after all, we women cook to please our men, don’t we? And it’s a wise wife who learns early the importance of the words, “I made it especially for you!” A man’s favorite dish–whether it’s dumplings, steak or lemon pie–is still the way to his heart. Perhaps this springtime meal, so popular with many men, is already a favorite at your house. i cook for you and you give me your heart again?